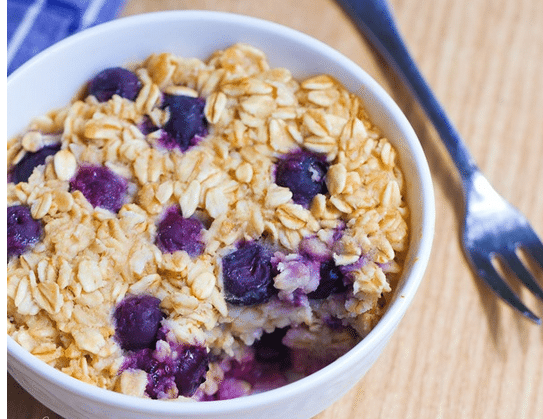 Blueberry Baked Oatmeal Mug Cake – a filling & nutritious breakfast, bursting with blueberries! 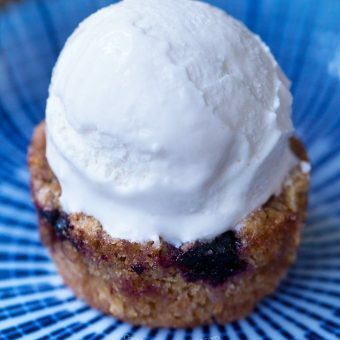 Packed with wholesome oats, sweet blueberries, and just a hint of vanilla, this single-serving breakfast mug cake tastes like eating dessert for breakfast. You can also opt to switch things up and eat it later in the day as a filling snack – or breakfast for dinner! If you’re rushed in the mornings, this is an easily portable breakfast; and you can make it in the oven or microwave, whichever you prefer. Grease a 1-cup ramekin, dish, or mug. Stir together all ingredients except the berries. Gently stir in the berries so they do not break. Pour into the mug or dish, and put on the center rack of a non-preheated oven. Turn the heat to 380 F, and bake 28 minutes. If desired, you can also broil for the last minute. Alternatively, you can cook this recipe in the microwave – time will vary greatly depending on wattage. This looks so good! I’ve tried mug cakes to little success in the past but never tried adding mashed bananas – I bet that helps a ton with the texture! I can’t wait to get home and give this a try! If anyone figures out approximately how long to do this on a microwave, please share. Most likely same as them all. 30 second intervals. Keep an eye on it after a minute and be careful not to dry out. It may look undercooked, but like a typical cake, check with toothpick after two intervals of 30 seconds (a minute). I made it with honey, the rest I followed the directions..cooked it 6 minutes and it is wonderful! I microwaved it for 2min.30sec. total. This looks fab. 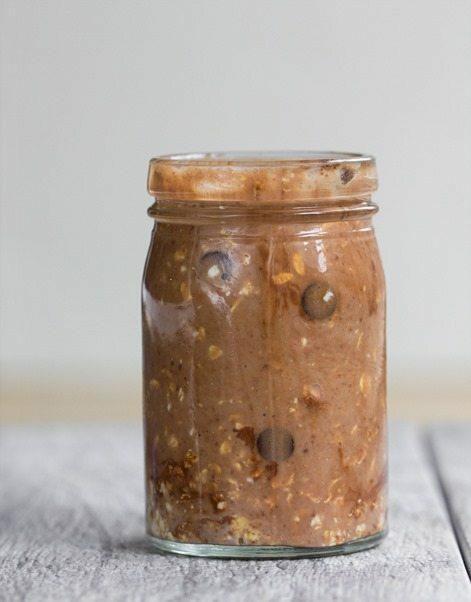 Do you use quick cook oats or normal? Can you tell me what the saturated fat content is please. Normal oats. And there’s a link for the nutrition facts. Thanks for replying. Do you have a UK release date for your next book yet? I LOVE your website. You have helped save my sweet tooth as I worked to lose weight. (Made a single lady cookie tonight!) I’m not sure how you’re calculating your WW points but I think something is wrong. When I enter this in the calculator it comes out to 8 smart points. A few other recipes you’ve posted lately have been too low in the listed points too. Not sure what’s going on, but you might want to check into it since so many WW people love and use your site. Thank you for all you do! I LOVE blueberries. 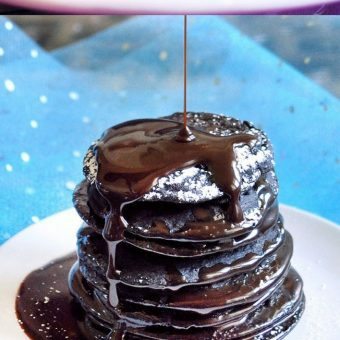 This looks like such a good way to calm a craving for a heavy dessert! Hi Katie! I just wanted to say that I like how you still publish recipes for baked oatmeal; when I think of CCK, I think of baked oatmeal, so I’m glad you’re sticking with your roots 😉 Also, your photography is so gorgeous! I miss reading your more personal updates, though. I understand why you’ve eased up on them, since the site has taken off so much, but I know I’d love to see more day-in-the-life-type stuff. Just my two cents, though. CCK is still an awesome site, no matter how personal you get with it! 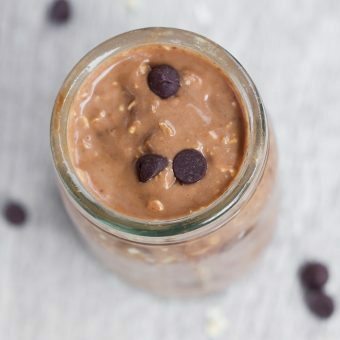 What a great recipe and healthy snack that the whole family could enjoy. 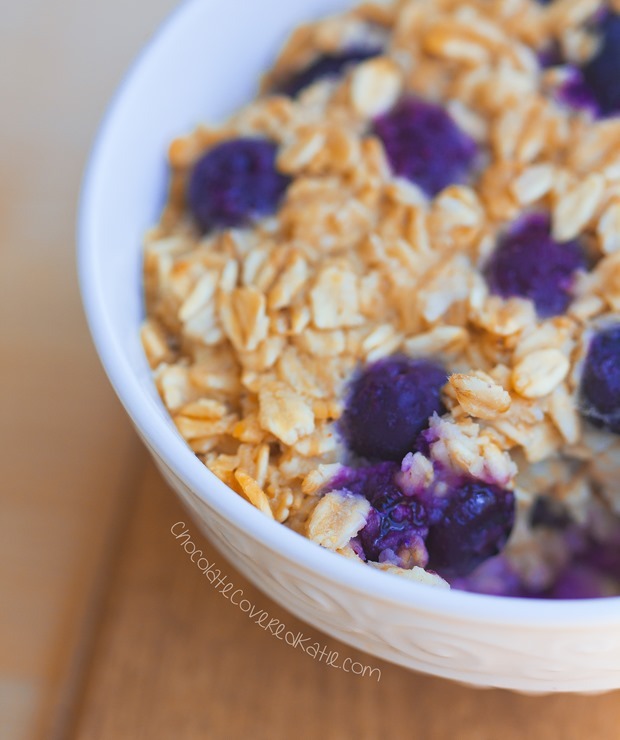 I love blueberries and oatmeal is one of my favorite breakfast foods. Together how could this recipe go wrong, well…, assuming I don’t over-cook the oats. Thanks for this fantastic recipe. Woah woah woah! I definitely need this in my life. Can I use chocolate chips instead of blue berries? It has to be possible! You can always experiment! And be sure to write back to let us know how it worked out, if you do. Wow. This cake looks too beautiful and I just can’t wait to try this. Yum! I just made the microwave version and it was so delicious! I used soy milk, a mashed banana, and stevia, and I found that 2:30 in the microwave got the right consistency (I checked every :30 seconds). It’s really hot, but I like that it makes me eat a bit slower so I can really savor the dish! The microwave still managed to give the oatmeal a baked taste, which was really nice. Next time I will try to bake this in the oven! Has anybody tried to make this for a larger crowd by making it a casserole dish? Kinda like this https://chocolatecoveredkatie.com/2016/06/23/berry-overnight-breakfast-casserole-5-ingredients/. Just wondering how to adjust the baking time. This is absolutely delicious! My husband and I eat gf, and this truly hit the blueberry muffin craving we were having. Thank you, Katie!! 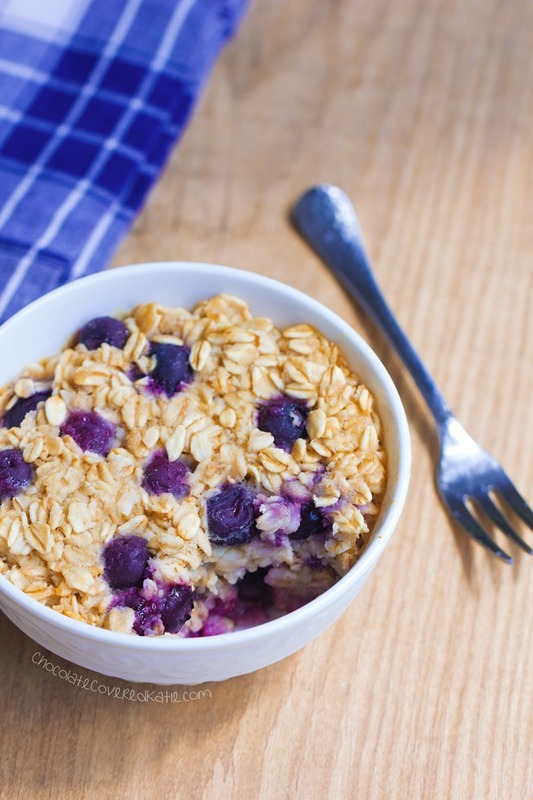 delicious blueberry baked oatmeal recipe! i will just use half the oil next time. other than that, thumbs up!! I adjusted this to use raspberries, and it was just as good! I really like the bananas as an option, not an applesauce fan. Thanks for the great dessert! I just whipped this up in the microwave for approximately 4:30 minutes, and it was delish. This will be a morning goto recipe for me. Thanks. Katie, I’ve been a long time follower of your blog and I just love your recipes. I was a vegetarian for many years and no longer am but i still prepare many vegetarian dishes and am a big fan of vegan baking. To me it has a cleaner taste and is more satisfying. I am also allergic to wheat so allot of your recipes are great for that. I specifically wanted to tell you about this though, I am doing BLW (baby led weaning) with my daughter. Since she was 6 months (now 10 months) This is the only baked oatmeal recipe she likes and its perfect amount and ingredients for BLW. Thank you for all you do from me and from my daughter. I made this for breakfast today. Freaking Awesome. 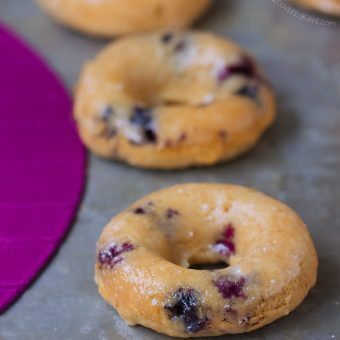 I added some cinnamon and used frozen blueberries,microwaved it for about 5 minutes and then let sit for about 5 minutes, topped it with plain greek yogurt, Oh my word it was fantastic. Thanks for the recipe, canèt wait to try more of your recipes.